Moving to Lake Forest, California. Considered by some to be one of the best beach towns in the United States, Lake Forest, CA may be a wee bit inland, but it’s still making waves! Lake Forest lands at #32 out of 205 US Cities in Wallethub’s survey of best beach towns! It’s no surprise to us that when comparing the cost of living, median income, housing costs, property taxes, ocean temperature, nightlife, restaurants, coffee shops, and crime rate… Lake Forest is an incredible place to live! We are huge cheerleaders for this piece of paradise in the OC! A-1 Self Storage in Lake Forest will be here for you from day one. Need advice on where to grab some grub? Wondering how to find the most desirable real estate? We have some great information to share with you. Read on! Eucalyptus tree groves have been growing here since the 1900s when a local landowner decided he could plant trees and bring the lumber industry to the area. Today, this one decision to plant 400 acres has led to beautiful residential communities within the spreading groves of eucalyptus! Dwight Whiting (that all-important planter of eucalyptus) was a vital part of bringing the Santa Fe Rail Line to Lake Forest. Unfortunately, according to his obituary, it was a trip on the Santa Fe which ultimately led to his death. As the story goes, Whiting sustained injuries while walking down the aisle of the train car. The train came to a sudden stop and he was thrown against the corner of one of the seats. The impact caused internal hemorrhages which led to his death days after. If you run into a local who refers to Lake Forest as “El Toro”, don’t be confused. 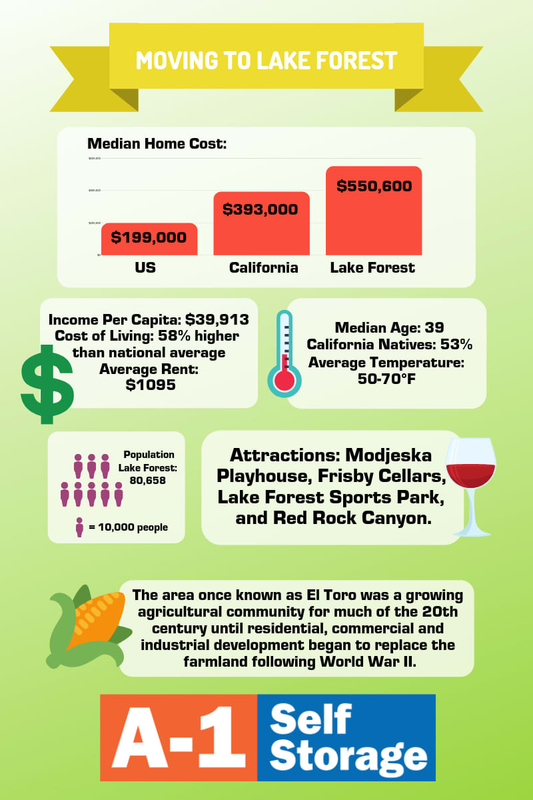 Prior to 1991, when the city incorporated, “El Toro” was the name for a large swath of what would become the city of Lake Forest. When city limits expanded in 2000 Lake Forest swallowed up the Foothill Ranch and Portola Hills developments. The city of Lake Forest consists of two lakes and may seem more like two large and separate resorts complete with clubhouses, hot tubs, saunas, swimming pools, and plenty of areas to work on your beach body! With 80,000-plus residents, what is the best way to get around town? If you jump on the Metrolink, there are two lines that stop right here in Lake Forest. One line runs from San Bernardino to Oceanside and the other one runs from Ventura to Oceanside. Interstate 5 and the 241 run parallel on either side of Lake Forest, and nearby Irvine is where you can find the closest Amtrak station. Lake Forest has many options for transportation, so catch a ride and let’s discover the ins and outs of this beautiful city! Need to catch a flight? While most people think of LAX (Los Angeles International Airport) when flying into Southern California, John Wayne Airport is right next door. In crunching the numbers, it’s important to decide if Lake Forest is a realistic option for your lifestyle. The temperature here is 60°-70° on average. The shorelines are filled with beautiful places to live. Homes on Lakeside Drive can range from $850,000 to well over $1M. Median home values inland here are $550,600. Per capita income in Lake Forest is higher than the national average at $39,913. The median household combined income is over $92,000, which means people who live here make more combined than 67% of US residents, but the cost of living total is 56% higher. Lake Forest is enticing for many reasons! Major employers here include Oakley, Inc. with 2,400 employees and Panasonic Avionics Corporation with 2,370 workers. Along with Oakley, this city is best known for Rick Warren’s megachurch, Saddleback (8th largest in the US) and the corporate headquarters of Johnny Rockets. The employment rate here is 20% lower than the US average and the median age of residents is 39-years-old. You’re probably wondering what it costs to live in Lake Forest. Let’s start with an insanely beautiful 5-bed, 5-bath house. This is the most expensive option at $10,000 per month for just over 4,000 square feet! Okay… so what is the least expensive rental? How about a 1-bed, 1-bath (325 square feet) for $1095 per month? No matter your budget, don’t worry. A-1 Self Storage can take care of everything you can’t fit in your home. We can help you decide what size unit you need and give you the best deal possible! If you’re looking to live near where you store, there are plenty of condominiums and apartments close to our property off Lake Forest Drive. The closest apartment complexes to our location are The Arbors Apartment Homes, Spring Lakes, Ridgecrest, and Westridge Apartments! If owning a home for your family is the goal, look to the aforementioned Portola Hills and Foothill Ranch communities in Lake Forest. The Oaks At Portola Hills are breathtakingly-gorgeous properties with outdoor kitchens overlooking the Saddleback valley! There are seven distinct neighborhoods within this gated community. One of the perks of living in Lake Forest is the large number of condos available in the area. There are beautiful condos wherever you look! For about $420K you can enjoy a 1,442 square foot condominium with 2-bedrooms and 2-bathrooms. Many of these developments feature a shared community center and pool that you can enjoy after a long day at the office! After work, you’ll probably be interested in hitting the town for cocktails and dinner. How about hitting up the urban winery and tasting room at Frisby Cellars? The wine is made from grapes sourced from the well-known Paso Robles vineyards and transported to Orange County. This cellar is open Thursdays, Fridays, and all weekend long. For live music, Our Place is a super friendly environment with great cover bands and they even have karaoke. Club Aficionado Cigar Bar is a first-class establishment where you are welcomed by the owners and led to the cigar lounge! Plenty of wine is also to be had at the Urban Grill and Wine Bar where seafood and steaks are featured on the menu as well as sandwiches. The menu here is for everyone. There are plenty of options for the kids and don’t forget brunch on Saturdays and Sundays! Would you rather have a light snack and some coffee? Check out Bagels and Brew! This is a cafe with three regional locations where all the food is made from scratch. Bagels are kettle boiled, and they use high quality ingredients at this family-owned business. The Modjeska Playhouse made its debut in Lake Forest in 2007. This not-for-profit organization was started by a group of high school students from the area. Located on Bake Parkway, the playhouse looks like an office building, but inside it’s an intimate theater known as a great place to see local theater. Recreation in Lake Forest can be found at the many beaches within 10 miles of the town. Crystal Cove is an Orange County treasure as is Corona Del Mar State Beach. MTV’s hit reality show Laguna Beach is famous for stunning rocky coasts and beautiful sunsets! Lake Forest Sports Park hosts everything from soccer games and basketball tournaments to farmer’s markets and an Annual Pet Expo! Hiking enthusiasts flock to Red Rock Canyon in Whiting Ranch Wilderness Park for an easy day of hiking with views reminiscent of Utah or Arizona. Parking here will only cost you $3 per day. Be sure to check the website for OC Park alerts before you decide which trails to hike as some have been closed due to the need to recover from recent wildfires. After hiking, you may just feel like going someplace to eat and grab some deals. If so, The Orchard is the place to be! Frequented by locals, Bru Market and Grill makes a day of shopping easier with big portions and delicious drinks. Time to Move? Why Wait? Loving the idea of moving to Orange County? Maybe it’s time! We here at A-1 Self Storage in Lake Forest are ready to support you when you arrive. Come by and see us at 26390 Forest Ridge Drive. We’re open from 9:00 a.m. to 6:00 p.m., Monday through Friday and you can always reach us by phone at 949-445-6749. Hope to see you soon!